Do Mosquitoes Like You Too Much? 1. Carbon-di-oxide: Mosquitoes are attracted to carbon-di-oxide. 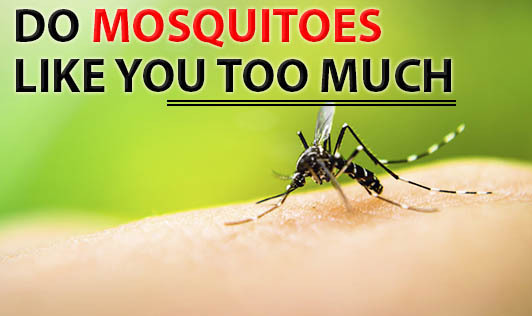 So, the more carbon-di-oxide you give out, the more mosquitoes bite you. This could be the reason for adults and large people being bitten more often than children. 2. Blood type: Each blood type releases a particular odorant which makes these mosquitoes find you. Not all mosquitoes prefer the same blood type. The preference varies between species. Type "O" has been found to attract most mosquitoes! 3. Heat and movement: Movement increases carbon-di oxide, lactic acid and heat production in the body, which makes you easily detectable. 4. Pregnancy: Pregnant women give out about 21% more carbon-di-oxide than a normal person, making them an easy target. So, now that you know what makes you a target, keep your lotions, mosquito repellents, newspapers and magazines near you to swat them away from you!